„To me“, that is what my friend Anna said, „to me slow media is brand eins.“ Everytime she is at home at her friend Peter’s house – who subscribes to the magazine brand eins for years – and everytime she has time and quiet to do so, she reads a brand eins. And everytime she likes it, she says. “No matter whether it’s the current issue or from the last year. Even if I do not agree to every article, brand eins is always well done and worth reading.” This describes exactly what I want to call media sustainability. The articles published in brand eins are longlasting and stay fresh over months and years. Their effect does not stop with actuality, nor does it stop at one single reader. A brand eins is enough for several readers. Behind Slow Media are real people, that is what we say, and you can feel that. And that is how you feel behind brand eins the people who make it, people who always believed in this magazine. Even after the failure of Econy, the forerunner of brand eins, they believed in bringing close economy and ethics. And in including high-end Editorial Design (still cared of by Mike Meiré). Of course the chief editor Gabriele Fischer and her team do not write all the articles themselves. But their way to look at the world, the values they share and their attitude towards their readers speak to us throught their magazine. This is not just showing-off, something they only say or pretend to be. You find these values – without getting too much into details – also in the contracts with their authors. Of course authors also give away their rights of use, just as in other magazines. But – and that is a big difference – they are spoken to as respected partners who add value to a valueable content. Trainees are told to write articles that are worth reading even after an year. So what my friend Anna told me was no coincidence. This after-effect is a declared aim. This luxury of quality is not only focussed on hit and run selling but on longterm effect. The ambition is being read and inspiring people, not just selling. It’s about bonding with the readers. And that creates loyality. This attitude allows courageous decisions. For example the Special Edition April 2000 (sustainability until now: over 10 years). The first 30 pages are dedicated to the Cluetrain Manifesto and its 95 theses concerning the change of the markets driven by the internet. The Cluetrain Manifesto is now known to have been visionary. It has still unbroken, even increasing actuality (itself a perfect example for slowness). At that time is was unknown and strange. Everyone else was happy with the dotcom-boom. It was not evident to talk of markets being conversations and of the end of fast profits. 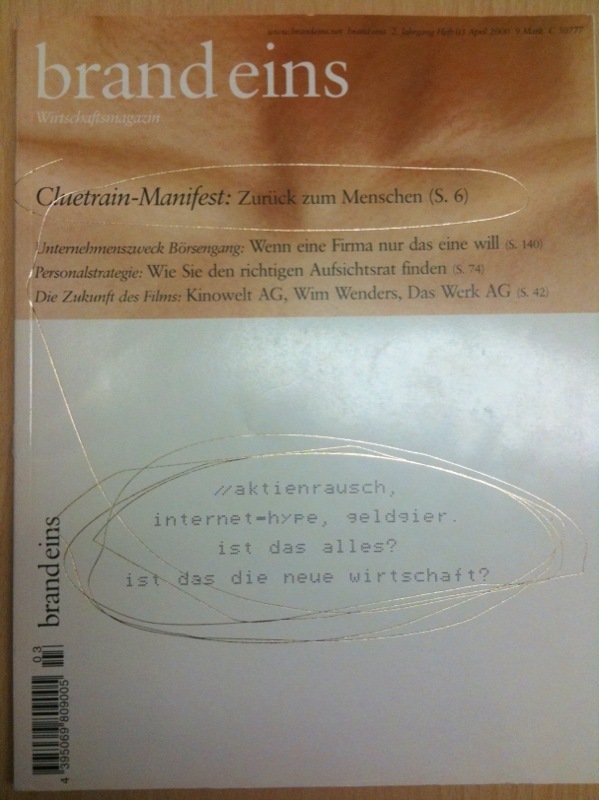 But the manifesto touched the brand eins team and they decided to follow their inspiration with a special edition. This was exactly while the boom peaked in mid march 2000. “Didn’t we – despite all enthusiasm for the founding boom – expect more from the New Economy than just more and still more millionaires?”, asked Gabriele Fischer in the preface of that special edition. Managers and politicians didn’t want to answer, their press officers where told to say they didn’t have time to answer that sort of questions. Well, but the brand eins wanted to look for answers. When did they finalize the april issue? Before the crash? At the peak? After the crash? Anyway. An opposite position like that was courageous and risky. You don’t do this when you just want to sell your edition. So here is good news for those who think “slow” might be just romantic and far from reality: Users feel the mindset behind media. They notice the ambition behind it – like my friend Anna – and they are ready to pay for it. Slow Media can be well done and profitable. You might say that Anna herself did not pay for the magazine – so inspiration does not necessarily create profit. Here is my answer: Her friend Peter does not have time enough to read the brand eins, but he still subscribes it. He would never cancel his subsription of brand eins just because he does not have time to read it. He stands by his magazine, he told me, no matter how short time is. That is loyality between readers and their magazine. Gabriele Fischer just answered the question “When did they finalize the april issue?”: The april issue was already produced when the dotcom-boom was still blowing up. The Cluetrain-Special-Edition of the brand eins was in the printing process when the dotcom-boom turned into a bursting bubble on March, 13th.